That was all fated to change with my arrest under the draconian Internal Security Act (ISA) of Malaysia, which allows for indefinite detention without trial. My crime? I had known Anwar Ibrahim, the deputy prime minister and finance minister of Malaysia, as a close personal friend for many years. We shared and strove for a vision of life firmly rooted in human dignity. We struggled for building an intellectual and political milieu for free expression. Together, we subscribed to the idea of economic prosperity, gender and racial equality and a civil society. 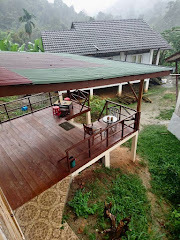 My kidnapping and detention by the infamous Malaysian Special Branch taught me how it feels to be forcibly separated from one’s wife and children. How it feels to be searched and seized, disallowed to make phone calls, handcuffed, blindfolded, stripped naked, driven in an animal cage, shaven bald, endlessly interrogated, humiliated, drugged, deprived of sleep, physically abused. What it’s like to be threatened, blackmailed, tormented by police lawyers, brutalized to make a totally false confession, hospitalized for a consequent heart ailment, and treated as a psychiatric patient with symptoms of Stockholm syndrome. Weekly visits of less than an hour by my wife, Nadia, with our young children — Aisha and Omran — were my only contact with the outside world and the only inspiration to live on. In collusion with the lawyer appointed on my behalf by the police, the Malaysian authorities refused the legal assistance of my choice, coercing me not to mount an appeal against the court verdict and threatening me with greater punishment under new charges if I didn’t co-operate. 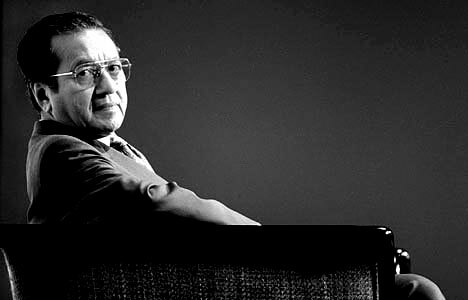 Floodgates of human compassion were opened when the futurist author Alvin Toffler, who Mahathir asked to advise him on a pet high-technology project, sent a message of protest to the Malaysian leader within 72 hours of my capture. In a major interview with the Western press, Mahathir even felt it necessary to make assurances — unfulfilled, of course — about my well being. Friends and strangers alike took a stand and support began to mushroom everywhere. Nadia related to me in the hospital how Amnesty International had declared me a “prisoner of conscience,” and how Pen International adopted me as a “writer in prison.” Against all odds, two prominent Malaysian lawyers, Manjeet Singh Dhillon and Balwant Singh Siddhu, offered their services unconditionally. To top it all, an international coalition — Friends of Dr. Anees — came into existence in defence of my rights. The core group of Naseer Ahmad, Baseer Hai, Safir Rammah, Jamal Mubarak, Anees Ahmad and Naeem Siddiqui mounted a media campaign with phenomenal success. My victimization at the hands of Mahathir’s “Asian values” has transformed me in another way. All my adult life, like so many in the Muslim world, I have suspected under every nook and cranny some conspiracy by the West to keep us down. 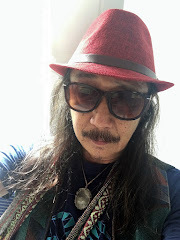 Yet, in this seminal experience of my life, my friends in the West succeeded in saving me, while Mahathir, a Muslim, did everything to destroy me. And he is trying to do the same to Anwar again through his obliging courts on totally fabricated charges. I well remember Munawar's trial when he was brought in half-drugged and even the judge had to express some misgivings as to whether he was fit for trial and in full possession of all his faculties. And that these strange lawyers appeared out of nowhere to defend him and advised him to plead guilty. If Muslims can do this to their own, what hope is there for others? Now is the time for Munawar to file a case of false arrest & conspiracy against Dr.M, the lawyers concerned, the AG's office and the BN Govt. He must not remain silent!! that's the power of Mahathir. Anwar, LKS, Hadi..bring it on.he will destroy them into ashes. You guys should read his joke today ... something "I am glad Malaysia is PARED from the global financial meltdown!" 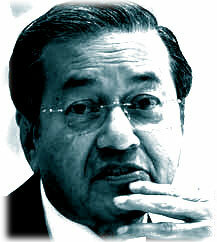 Mahathir is not strong. By using state institutions to crush opponents, he has taken cowardice to a new dizzy level. If you want to compete with your opponents, then come to the playing round with the same tools. Using state institutions doesn't make you strong in anyway. 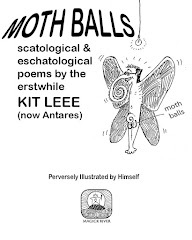 It is the culture of poltroons to carry batons. Bravery is all different from that infantile, base culture of Mahathir that thrives in an unadulterated hatred. And boy, Hadi Awang, Anwar and Lim Kit Siang are in the ground influencing Malaysia despite his crude cowardly tactics in the past. They are brave and refuse to surreder or cry wolf and resign whenever their wishes are not entertained ala Mahathir who left Umno when he failed to dislodge Dollah only for his wife and driver to join him. Sheesh. It took Hadi, Anwar and Lim to dislodge Abdullah by bringing Malaysians on their side. And you will see one of them as the PM sooner than you can imagine. Mahathir thought they will surrender to his cowardly and venal tactics but he forget the Kiswahilin saying: "Ukaona simba imenyeshewa, ukadhani ni paka" (You saw a drenched lion and you mistook it for a cat). Mahathir thought lions like Anwar, Lim and Hadi were pussies after he trampled upon them using brute force. You can bet your last penny that they were not. Stupid! Old turkey buzzard.With lips bent downwards like a bow is a sure sign of an evil and a reculcitrant old man! Mahatiu is most probably the biggest hypocrite in all of South East Asia, the bugger preaches about the ills of corruption yet he was the father of all corruptions while he was the PM; the pretender talks about democracy but he was the most oppressive dictator Malaysia ever had. The now 'defender of rule of law' was the one who dismantle the integrity and independence of judiciary ! A vulture of the highest order? than you. thank you. for sharing this article. 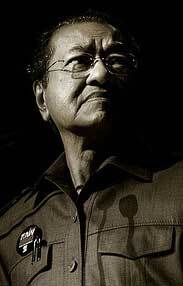 Mahathir is true nationalist. He fight fairly for Malaysian. Well what to do, people don't like him. What you are standing now is the fruit of his idea. When you don't have a bit on kind heart of thankful, the world is not enough and brings you towards greedy. Anwar is a greedy person same as DAP. What i see BN will still run this country. So if you don't like just pack your bag and hit the road. Australia, Canada, New Zealand and even Singapore welcome you. Why stay in this corrupted country. Why make noise since you can migrate to any country and have peace of mind. The article written by Dr. Munawar Anees is way since 2008. What I see, he use the issue of BN loosing as the Mahathir is the main factor of the collapse. As a prostitute writer and revenge, it is understand that all article related to Mahathir is more political, emotionals than facts. Don't waste your time with this Munawar. His articles on Malaysian politics were numerous rejected by renowned International Statistic Research Institution. Well use you brain rather than your heart to judge on Dr.Munawar. Anon @ 10:49AM & 11:05AM - From the syntax I suspect the comments are from the same Mahathirite (what some might call a Devil-worshiper!) 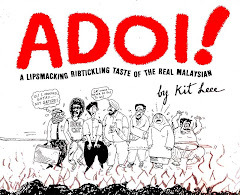 I can sense that you're not really a "bad" person yourself - just uniformed & blinded by your upbringing - not to mention two generations of all-out BN propaganda which has made you a serious case of "katak di bawah tempurung." Obviously, you are unaware that Mahathir has cleverly put most of his stolen money in his children's names - do you seriously believe that Mirzan, Mokhzani & Mukhriz could have become billionaires without the Mahathir name? Same lah with the Sukarno family in Indonesia & the Marcoses in the Philippines or the Ben Ali family in Tunisia or the Bush family in the US. Semua turunan buaya! Well, if you REFUSE to see, nobody can force you to look more closely. But your opinion - "if you don;t like what Mahathir has done to Malaysia, pack your bags & go elsewhere" is typically Umno. We've heard it too many times from idiots like that Mamak witch Sharifah Zohra Jabeen. Not a very intelligent or evolved way of looking at life, unfortunately. 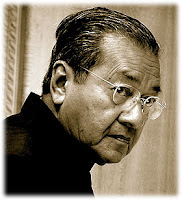 Mahathir a nationalist?Haha! He nationalized the wealth of the country for himself,his family and cronies,alright! Sad thing is you still have the blind and dumb like Anon 10.49am heaping praises on this despicable racist and a cheat! mahatir, what is your defence? Denial again? how many billions more for your family? more in order for you to buy up he entire kerala to cancel out the sin of dropping off kutty? those who differ has to migrate? you sanction such dastardly and un-islamic fitnah? go kiss the toes of the dictator.